The following is a list of atheist shooters and serial killers. Atheists have a long record of being mass shooters and militant atheism in general has a causal association with mass murder. Due to this fact, peer reviewed research published in academic journals has found that society-at-large is likely to hold atheists responsible for capital criminal acts and that even atheists are likely to assume that serial killers are fellow atheists. “ A new study published in Nature Human Behaviour found that people around the world are predisposed to believe that atheists are more likely to be serial killers than religious believers — a bias even held by atheists themselves. By the numbers: The study included 3,256 participants across 13 diverse countries that included highly secular nations like Finland and the Netherlands as well as highly religious ones like the United Arab Emirates and India. Timothy McVeigh (April 23, 1968 – June 11, 2001) was the main perpetrator in the Oklahoma City Bombing on April 19, 1995, which killed 168 people in the worst act of domestic terrorism in American history. Contrary to the popular and oft-repeated belief among liberals and the irreligious, McVeigh was not a right-wing evangelical Christian. In fact, McVeigh was raised Roman Catholic, but professed agnosticism. His political beliefs were libertarian. 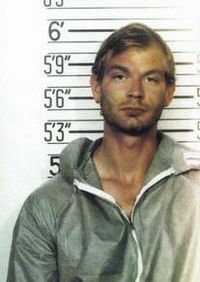 ↑ 1.0 1.1 Stone Phillips, Jeffrey Dahmer (1994). Jeffrey Dahmer Interview - MSNBC Footage. Dateline NBC. Retrieved on October 7, 2017. ↑ Pettit, Harry (August 7, 2017). Do we need religion to have good morals? Even atheists think horrific crimes are likely committed by atheists. Daily Mail. Retrieved on October 7, 2017. ↑ Atheists tend to be seen as immoral – even by other atheists: study. The Guardian (August 7, 2017). Retrieved on October 7, 2017. ↑ Daisy Grewal (January 17, 2012). In Atheists We Distrust. Scientific American. Retrieved on October 7, 2017. ↑ Sayers, Justin; Wolfson, Andrew (March 7, 2018). Gabe Parker saw Marshall County school shooting as an experiment, officer says. The Courier-Journal. Retrieved March 21, 2018. ↑ Police: Teen Saw Shooting as Experiment, Showed No Remorse. U.S. News & World Report (from the Associated Press). March 8, 2018. Retrieved March 21, 2018. ↑ Root, Kayla (January 25, 2018). Kentucky Shooter Joined Atheist Group, but Couldn't Stop ALL These Students from Praying. CBN News. Retrieved March 21, 2018. ↑ Stanton, Jenny (November 5, 2017). Texas church shooter Devin Kelley was an 'outcast'. Daily Mail. Retrieved on November 5, 2017. ↑ Shoebat, Theodore (November 5, 2017). Make No Mistake About It, The Man Who Slaughtered 26 Christians In A Baptist Church In Texas Was An Atheist Who Hated Christ And The Christian Faith. Walid Shoebat. Retrieved on November 5, 2017. ↑ UPDATE: Sutherland Springs Gunman Devin Kelley Wore "All Black" - Facebook Page Suggests He Was Diehard Atheist, CNN Fan. The Gateway Pundit (November 5, 2017). Retrieved on November 5, 2017. ↑ Devin Kelley: 5 Fast Facts You Need to Know. Heavy (November 5, 2017). Retrieved on November 5, 2017. ↑ Texas shooter Devin Patrick Kelley was a radical SJW Atheist!. OneHallyu (November 5, 2017). Retrieved on November 5, 2017. ↑ Katie Zavadski (October 2, 2015). Umpqua Gunman Chris Harper Mercer Hated Religion Online. The Daily Beast. Retrieved on October 7, 2017. ↑ Eli Saslow, Sarah Kaplan and Joseph Hoyt (October 2, 2015). Oregon shooter said to have singled out Christians for killing in ‘horrific act of cowardice’. The Washington Post. Retrieved on October 7, 2017. ↑ The Chapel Hill shooting: White male atheist murders three Muslim students. New Statesman. Retrieved on October 7, 2017. ↑ Keane, Brett (August 16, 2017). Atheists List of Killers and Criminals. GodTVRadio News. Retrieved on October 7, 2017. ↑ Wolcott, Martin Gilman (2004). The Evil 100. Kensington Publishing Corporation. ISBN 9780806525556. Retrieved on October 7, 2017. This page was last modified on 9 April 2019, at 11:48. This page has been accessed 28,370 times.